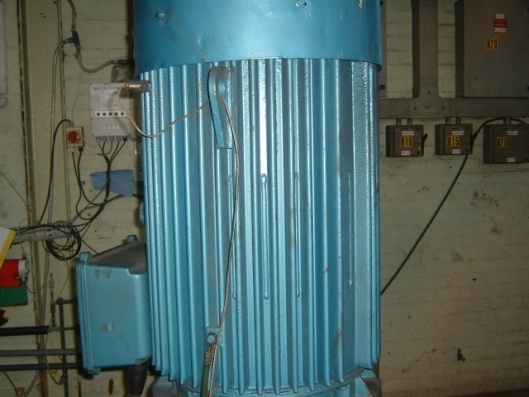 Vertically mounted, Ingersoll-Dresser 14HHS 300 multistage centrifugal pumps, driven by a Brook Hanson 110kw Flange mounted 4 pole, 415v ac motors. 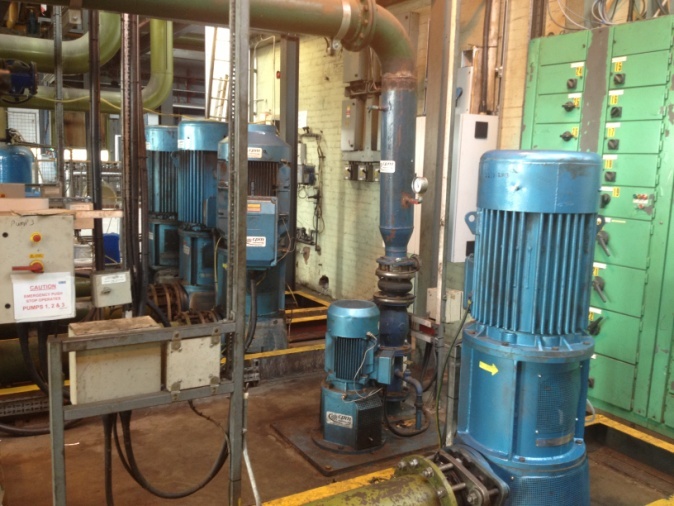 The duty cycle of these pumps can be extreme operating 24hrs a day and they are highlighted as critical plant by the operator, therefore all outages have to be planned for, downtime or the production process cannot be tolerated. Managing the risk is a key factor with only a matter of hours available each year to have them offline. In these instances non-invasive predictive maintenance techniques are an intrinsic part of understanding what is happening to the pumps and motors while in production. In this particular instance vibration analysis, oil sampling and thermographic techniques are used and the data is recorded and interrogated for trends using the very latest diagnostics tools and software. But in order to understand the mass of data recorded a thorough understanding of the pump design, construction and system is necessary if the correct interpretation of the information is to be made. 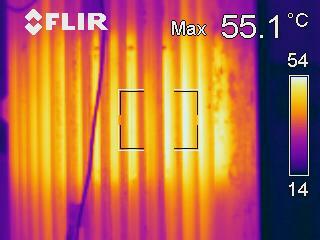 From this information correct decisions need to be made if expensive repairs and downtime are to be avoided. 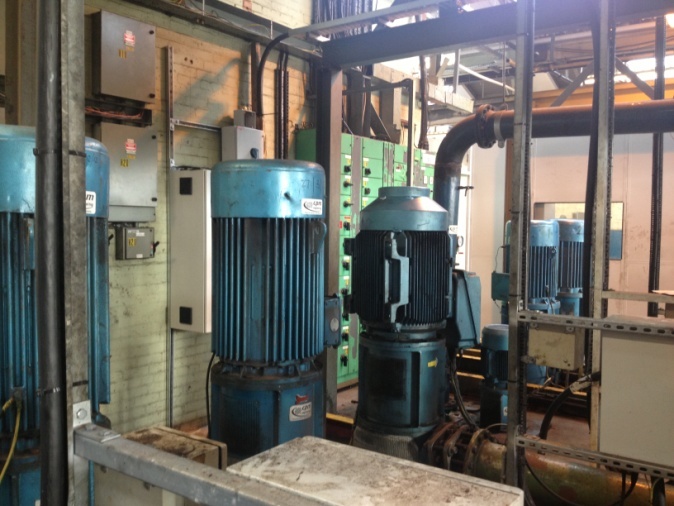 The MTBF (Mean time between failures) has been calculated as 3 years on these particular pumps following a number of years working with the operator. 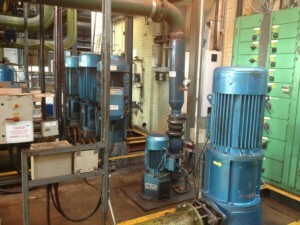 From this information a maintenance plan and ‘scope of work’ is devised with the pumps being taken out of production in rotation. The scope of work is known in advance of the pumps being removed which makes advanced planning easier and costs minimised by purchasing the correct spares, keeping premium working to a minimum and eradicating suppliers call out and delivery charges which can be quite significant. With experience of the monitoring and measurements taken during the ‘outages’ wear rates were calculated and also design and construction deficiencies ‘engineered out’ using best practice and also modern reclamations and application techniques some of which have been developed since the pumps were manufactured. Examples of these are the main pump shaft the Seal seats were suffering from corrosive wear, due to the abrasive nature, of the product. This was overcome by changing the material from which the shaft was manufactured. This ‘one off’ change means that the seal seats will not now need to be replaced again during the expected lifetime of the pump. An example of when rotating machines are not maintained and run to destruction can be seen in the photographs above. 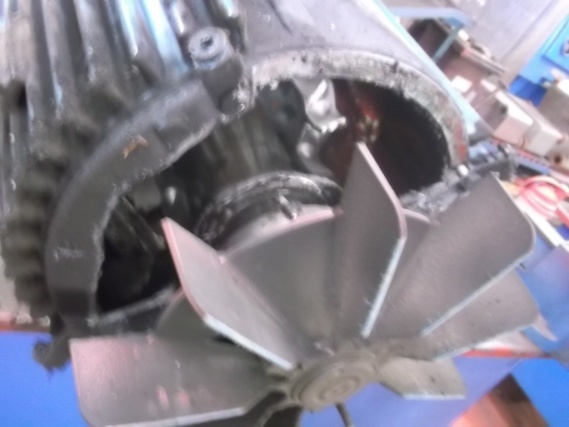 The motor shaft has pushed through the motor, vertically smashing the DE (drive end) bearing assembly and NDE (None drive end) end frame and bearing assembly, fan and fan cowl. 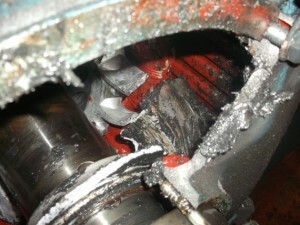 The shaft on the motor was also damaged beyond repair. Which approach gives the best return?